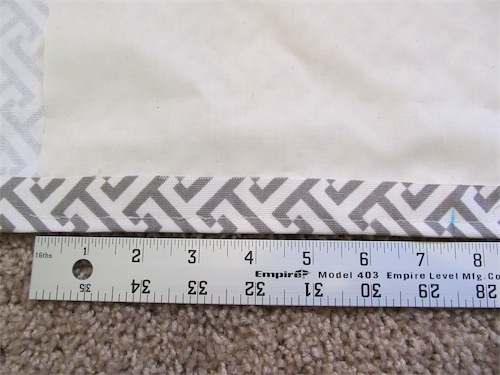 Step 1: Measure your windows. 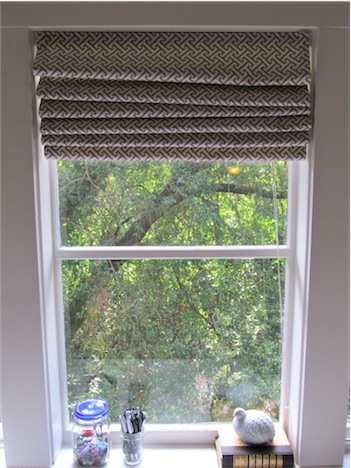 All of mine ended up being 1/4″ – 1/2″ different (oh the joys of old homes), so measuring each individual window opening proved to be helpful. 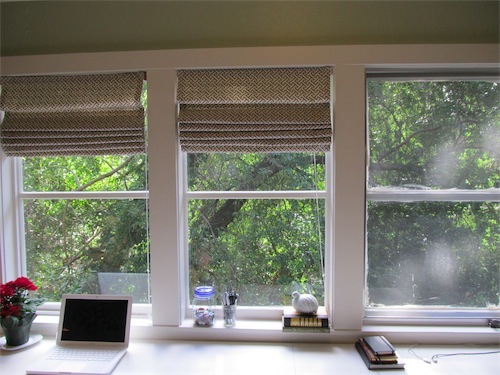 Cut your top fabric to be 2″ wider than your window and 6″ longer too (my first window opening was 27″ x 45″, so I added 2″ to the width and 6″ to the length and cut my top fabric to 29″ x 51″). 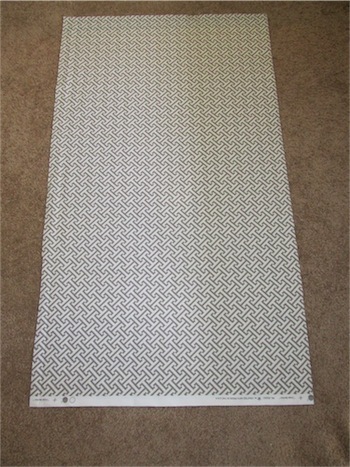 Step 2: Cut out your lining fabric to the exact size of your window (I cut mine out to 27″ x 45″). 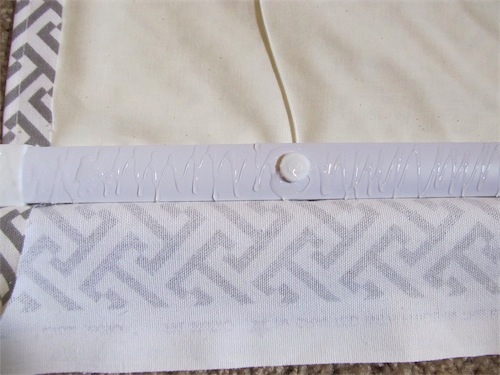 Flip your top fabric over so it is face down and lay your lining fabric on the back. 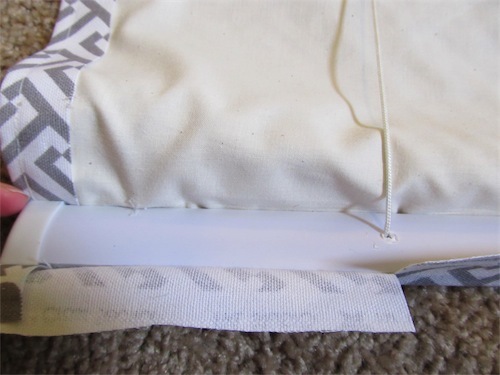 Adjust the lining fabric so that there is approximately 1″ of space on each side and 3″ on top and bottom. 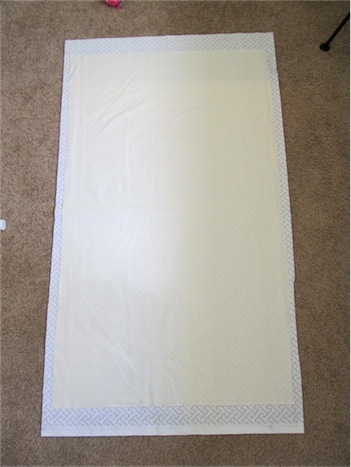 Step 3: Fold the top fabric over the lining 1″ and pin. 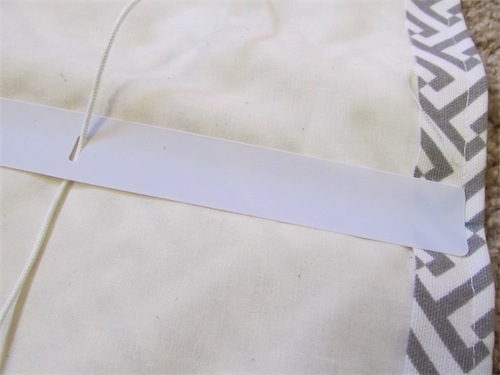 (This is where you could use the iron-on hem tape. If you’re going to do that, skip down to Step 6). 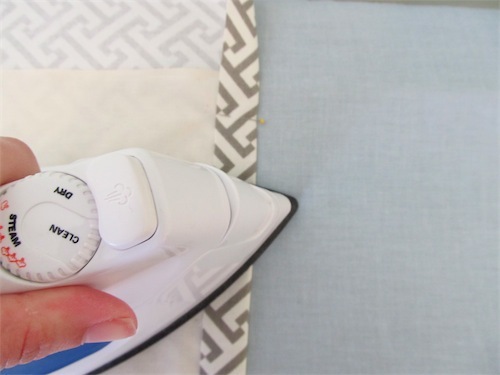 Step 4: Iron your folds well. 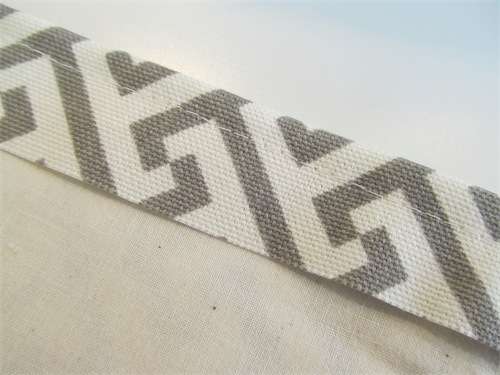 Step 5: Sew your layers together and set fabric aside for now. 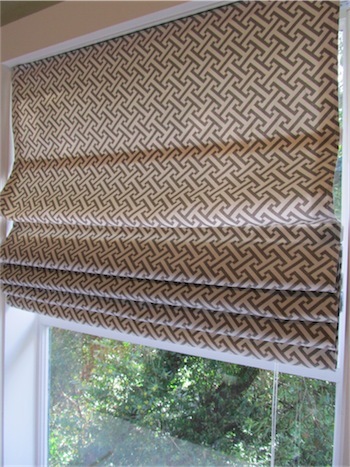 Step 6: Extend your blind out all the way and lay on a flat surface. 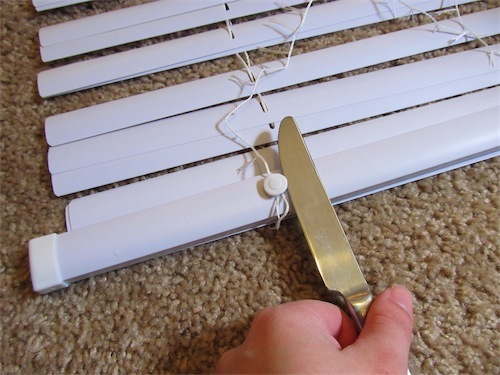 Step 7: Cut the string that controls the angle of the blinds. It looks like a ladder. 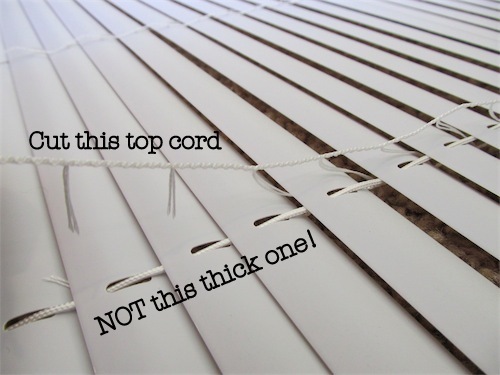 It is VERY important NOT to cut the thicker cord that actually lifts the blinds up and down. 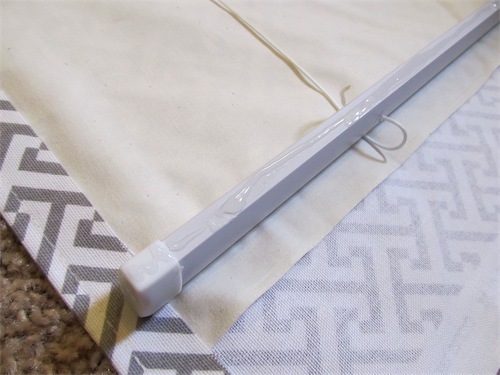 Step 8: Pop off the plugs on the bottom weighted bar of your blinds. A butter knife or screwdriver will help you do this. 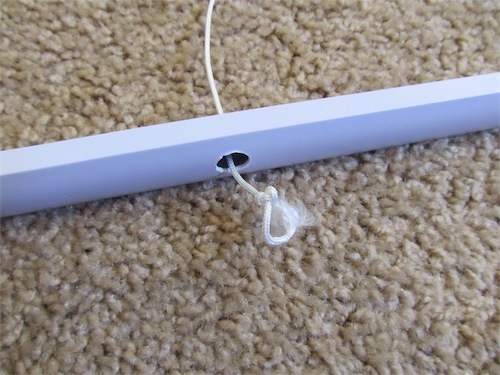 Pull the string out the bottom and untie (or cut) the knot that keeps the cord from coming out of the bar. 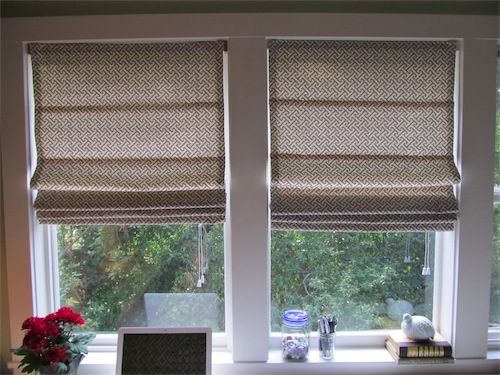 Step 9: Decide how many folds you would like your blind to have. 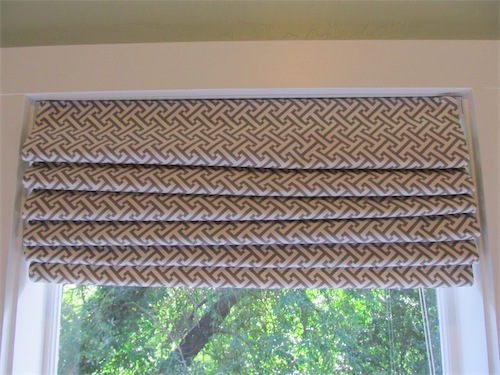 You will need one slat for every fold; your weighted bar will also create a fold, so take that into account (my window was 45″ tall, so I kept 5 slats + the bottom weighted bar equaling 6 folds that were 7 1/2″ apart). 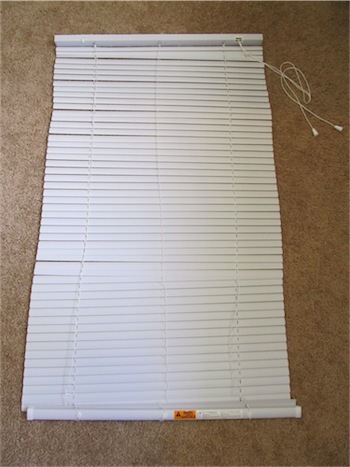 Take out the extra slats and throw away. 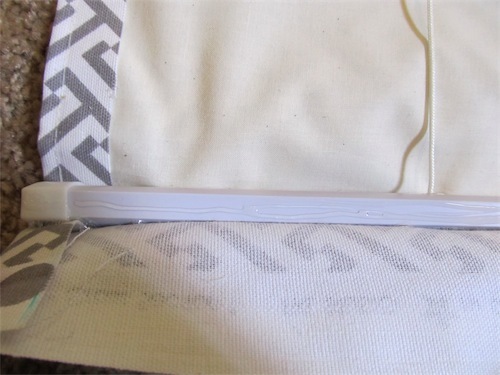 Re-thread your string through the bottom weighted bar and make a temporary knot to keep it in place. 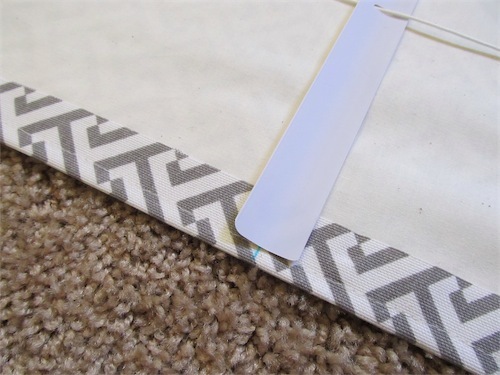 Step 10: Mark your spacing on the back side of your fabric (I marked six lines 7 1/2″ apart from starting from the top of the liner). 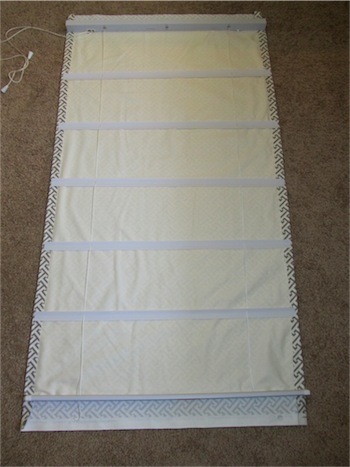 Step 11: Lay your blind on top of your fabric and align the middle of each slat with your markings. 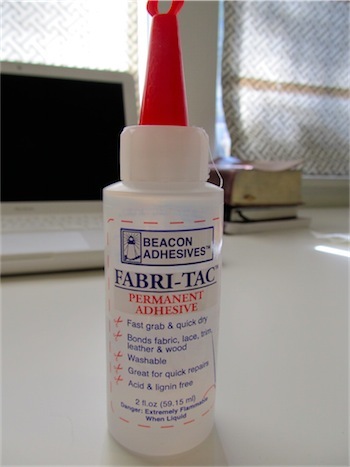 Step 12: Get your glue and carefully begin to glue down your pieces beginning at the top. Because my blinds slide into a bracket with a small plastic piece that holds it in, I didn’t glue all the way to the edge of my top piece. 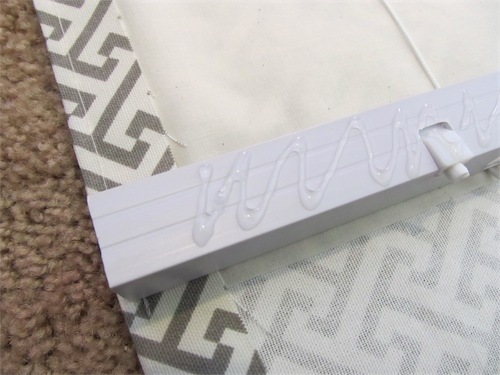 Glue on the curved side of your slat. 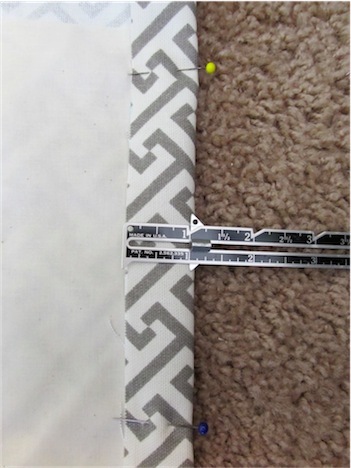 I did a zig-zag pattern with my glue to cover as much area as possible without having to spread it with a brush. 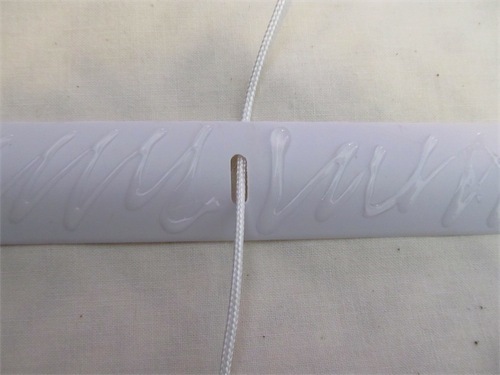 Be VERY careful to not get any glue on your pull cord! 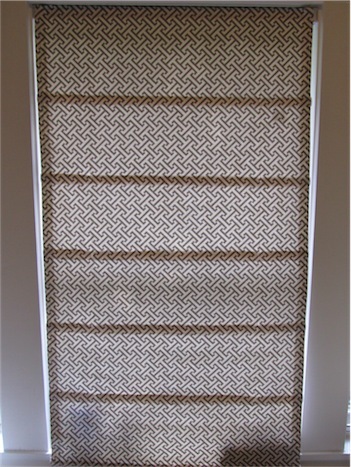 Flip over and firmly press down your slats, making sure that they are centered on your markings. 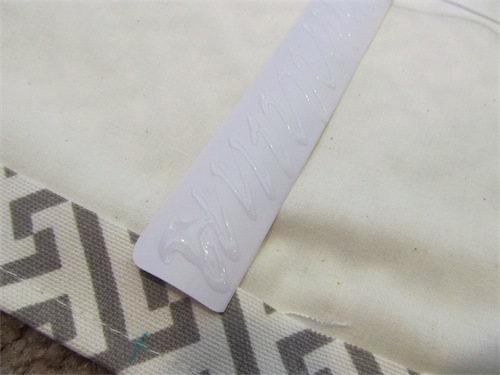 Step 13: When you get to your bottom piece, glue the front narrow side to the fabric and press firmly to set. Let it dry for a moment and then tie a knot in your strings. Don’t pull the strings too tight, but be sure they are not very loose. 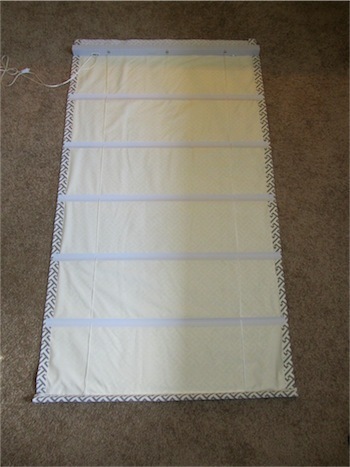 Replace the plugs and continue gluing the fabric to each side of the weighted bar. 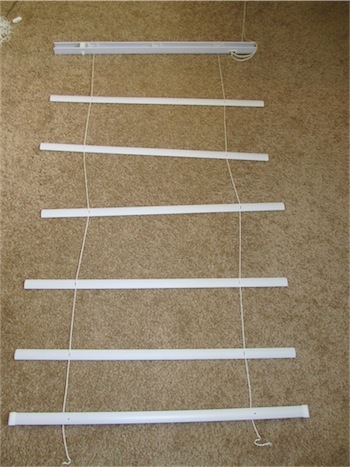 Step 14: Let your finished blind sit for a few hours at least (overnight if you can) to let the glue really set up. 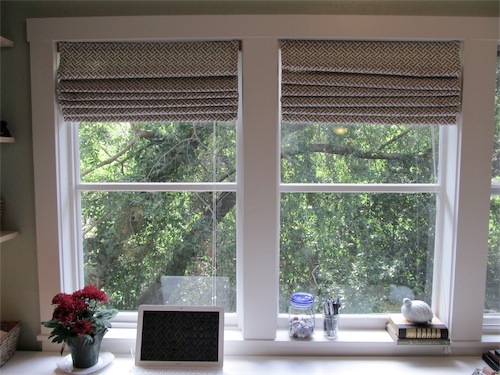 Step 15: Install your brackets on the side of your window frame (not the top!) 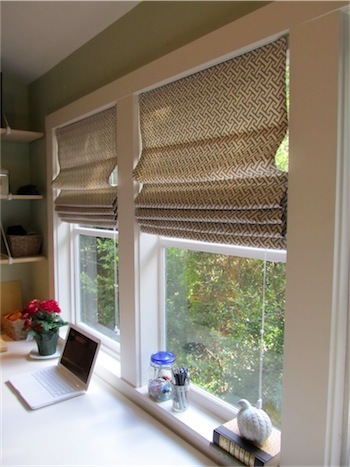 Be sure to leave a smidge of space between the bracket and the top of your window frame. 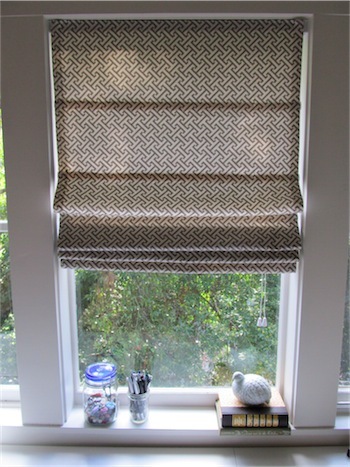 Take the excess fabric on the top of your blind and tuck over the top of your bracket. A few of the tutorials I looked at recommended using velcro to attach the excess fabric to the back of the bracket, but I haven’t done that yet. 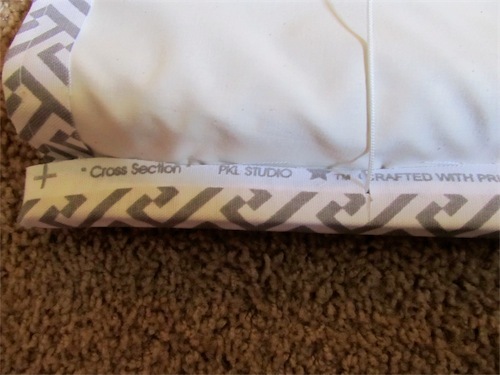 The fabric seems to be staying just where it’s at without any assistance, so maybe velcro won’t be needed. That third window is looking pretty lonely without a matching blind (which is finished, just waiting for a bracket). I’m so impressed with how these turned out! I spent a chunk of time on this project (probably 6ish hours split over 2 days) but the time investment definitely paid off. Organize the heck outta that closet. Sheesh, it needs some lovin’. Work on better organizing my craft supplies on the shelves.